Here at FLOCERT we all have one thing in common: we love what we do. Together with the Fairtrade movement, we’re united in our drive to make international trade fairer for everyone. The way we work allows us all to be the best versions of ourselves, every day. 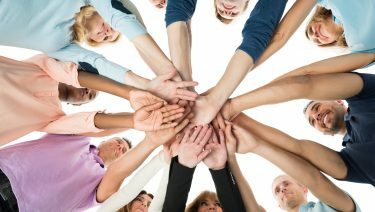 Our „social business“ status is another big motivator for us. It officially acknowledges that FLOCERT operates with the central aim of using income and profits to maximise positive social and environmental impact. you're interested in any of the jobs listed below, please be sure to follow the application process carefully and send your CV and covering letter in English. Don't see anything quite right for you? We'd still love to hear from you. Send us an email to let us know you'd be interested in working for FLOCERT in the future. Don't forget to mention what kind of role you're looking for, the area in which you'd like to work and your qualifications. FLOCERT is multicultural and service driven, with ethics at its core. 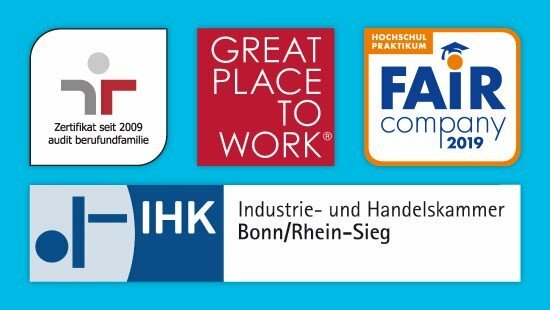 In recognition of the significance of our role in global Fairtrade, we partner with prestigious institutions including GreatPlacetoWork and Audit Berufundfamilie to make sure we're always working to our potential. If you'd like to join the FLOCERT family, check out our vacancies below or get in touch to register your interest. In line with the Fairtrade principles that drive us, we strive for excellence in every area of our work at FLOCERT. That means that when we're recruiting, we value attitude as highly as formal qualifications. We're proud of the diversity within our team – diversity of culture, creativity and ways of working. Each one of us contributes to our team spirit. FLOCERT isn't driven by profit. Our focus is on furthering the worldwide Fairtrade movement. We are highly values driven – and our values are the key to our success. When you join us you can be sure that you'll never have to move your ethics down your agenda. Our team of over 100 is spread right across the planet, but the distance between us doesn't keep us apart. We're in touch every day, sharing our enthusiasm for making global trade fairer and more sustainable. Our culture is considerate to us as people, not workers. Our modern ways of working – flexibility, shortened core hours, systems based on trust (e.g. no time-tracking), and options for home-working – enable us to be as productive as possible whilst achieving a great work-life balance. We strive to deliver exceptional service to our customers. To achieve that, we need to make sure the right people are in the right jobs. When you join our team we'll work out where your skills fit best, and throughout your career at FLOCERT we'll offer you great training opportunities and work hard to make sure you're happy in your role. We want you to be you. Your creativity, your initiative and your entrepreneurial spirit will always be encouraged at FLOCERT. There will be plenty of opportunities to develop your skills. And our open-door policy means that whenever you've got something to say, your manager will be there to listen. Being part of Fairtrade, we live by Fairtrade values. All our employees are recognized for what they bring to our organization with a fair salary and benefit package. FLOCERT is a unique place to work. You'll be part of a large, diverse, multicultural team – actively engaging with colleagues equally enthusiastic and committed from all around the planet. Our vibrant, dynamic workplace encourages creativity and initiative, with opportunities to express your personality and entrepreneurial spirit, and to develop your skills. We have an open-door policy too – your managers and colleagues welcome your views any time. We offer modern working patterns for all young and senior professionals – for instance flexible working times, shortened core hours, a trust-based working relationship (e.g. no time-tracking), home-working solutions and so on. FLOCERT welcomes the next generation of Fairtrade champions. In conjunction with the Faircompany initiative, we offer a raft of exciting opportunities to introduce interns to this extraordinary sector. FLOCERT is also a professional education partner in the German dual vocational training system, „Berufsausbildung“, which is an entry point for those accessing the world of work for the first time as apprentices. Our people are at various stages of their career and life cycles. Their well-being and health is very important to us. We aim to provide a work environment that is sufficiently flexible to accommodate diverse life-cycle challenges. We offer a competitive salary plus regionally specific, attractive benefits. Before you begin, it's a good idea to check whether you and FLOCERT fit together. Consider asking yourself a few questions. Do you share our values? Do you have the entrepreneurial spirit that'll help you take ownership of your role? Are you adaptable to the different cultures we work across? To become part of FLOCERT you'll need to be multi-lingual (including English), flexible and hard working, and always open to learning and developing. It's really important to be sure that you meet the specific qualification requirements for the job you're applying for. If you've reached this step, it's time to complete your application and send it to us using our [online job application system]. We'll contact you for an initial chat or first interview if we like what we see. If we can't meet in person this will be by phone or via Skype. The final step is a second interview, and often a relevant work test, either on site or virtually. Do you have a question for our Human Resource team?